Sew this adorable soft and cuddly baby doll using this craft pattern. Any child would love taking care of this sweet little preemie. The body is made out of Craft Velour and polyester stuffing for a doll that is easy to hug and caress. 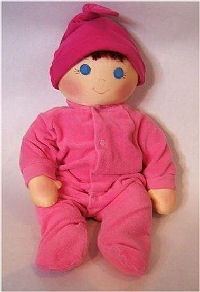 Once the doll is made you can slip on some pink or blue footie pajamas and matching knit cap to complete the look. This pattern has detailed instructions plus step by step pictures to help make sewing this sweet baby easy. Making a baby doll as a gift or just to give to your own little one is fun and rewarding at the same time.